The 2017 Formula 1 season looks like it is going to be a competitive one although, judged on the opening race of the year in Australia, Ferrari’s Sebastian Vettel has a definite early advantage. And with this weekend’s venue, China, being a very fair one where ‘form horses’ normally win and invariably start on pole-position, the German cannot be opposed in Sunday’s race. Skybet are currently offering the top-price of 7/4 about the four-time world champion. But there are plenty of other Formula 1 betting opportunities beyond the race winner. Stats bettors will love Ladbrokes 4/7 available about a winning margin in excess of 5.5 seconds. And while the record books show the 2015 race was won by just 0.7 sec, race winner Lewis Hamilton was a long way clear before a safety car intervened and was ‘on track’ when the race concluded. In addition to a wide-margin winner the stats tell us there should be a lot of finishers in Sunday’s race. The wide Shanghai circuit, which features gravel traps which do not actually ‘trap’, is kind to cars. Remarkably every one of the 22 cars which set out last year finished the race. There was only one retirement in both 2011 and 2012 and the recent average is less than two DNF’s per-race. bet365 are offering 5/2 about more than 16 finishers. So, with 20 cars starting out, you can afford three retirements and still be a winner with this bet – and that makes it a very fair looking F1 bet. Beforehand, in Saturday’s qualifying, Sebastian Vettel is surely overpriced at 11/4 to claim pole position. 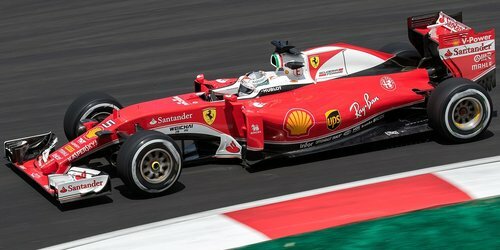 He may have started behind Lewis Hamilton in Australia a fortnight ago but the margin between them was just 0.2 sec and this circuit, with a far longer straight (1,397 metres compared to 843 metres), could easily see him make up and surpass that deficit when their cars are in qualifying trim. Once again this price looks exceptional and is probably based on Hamilton’s excellent record here – the Englishman has started on pole five times in the past decade) but Vettel has claimed three China pole-positions himself and he’s not had a competitive car since 2014.